The epistle of 1 John is written in some of the simplest language of all the 27 books of the New Testament. Yet, it contains some of the most difficult verses in the New Testament to interpret. 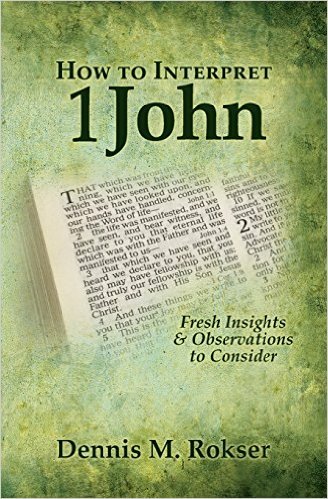 Pastor Dennis Rokser of Duluth Bible Church has written a 96-page book titled How to Interpret 1 John: Fresh Insights & Observations to Consider , published by Grace Gospel Press, for the express purpose of helping believers to accurately interpret this often misunderstood and misused epistle. How to Interpret 1 John is not intended to be a commentary on the entire epistle but instead is designed to answer the most foundational and important questions about the epistle, such as why it was written by the apostle John, who it was written to, and how to interpret several of its most challenging verses. Pages 3-18 of the book address the foundational question, "Who is this epistle written to?" Rokser proves from the text that 1 John was written to those who were already genuine believers in Christ rather than mere professing believers or even a mixture of genuine believers with false professors of Christ. The evidence to support the original recipients of 1 John being believers is closely related to the purpose of the epistle. The second main question addressed is "What is the main subject and primary purpose of 1 John?" On pages 19-56 Pastor Rokser shows that 1 John was clearly not written to provide a series of tests to determine whether you truly possess eternal life or not, which is the common misinterpretation of those who teach the works-gospel of Lordship Salvation, such as John MacArthur in his book Saved Without a Doubt . Rokser takes the 11 supposed tests of eternal life in 1 John as proposed by MacArthur and shows exegetically from the epistle that these are not tests of regeneration at all but instead that John gives the conditions and evidences of fellowship with God for the believer in Christ. Thus, John's main purpose of fellowship is spelled out in the opening verses of the epistle in 1:1-4. The last 40 pages of the book are devoted to interpreting three challenging verses and applying what was learned previously about the book's audience and purpose. The most amount of space is devoted to 1 John 3:9, which says, "Whoever has been born of God does not sin, for His seed remains in him; and he cannot sin, because he has been born of God"? Some interpreters claim that the word "does" in this verse speaks of a pattern in the believer's life, so that if you are truly saved you will not be continually sinning in your Christian life. But Rokser points out the problems of deciding what constitutes a "pattern" and how this interpretation cannot be reconciled with passages that clearly teach genuine believers can commit a pattern of sin, even unto death, like the carnal Corinthians (1 Cor. 3:1-4; 11:28-32). Nor does 1 John 3:9 mean that if you are truly born again you will not commit sin anymore at all, which is contradicted by everyday experience and 1 John 1:8-10. Rokser goes on to show that one crucial key to properly interpreting 1 John 3:9 is noting the characteristic writing style of John, called "ubiquitous shorthand" by the author. Rokser provides fresh insight into this little-known and seldom-recognized aspect of John's writing style and observes this in 1 John 3:9. He shows that John is essentially abbreviating his point from 3 verses earlier when he wrote in 3:6, "Whoever abides in Him does not sin." John uses shorthand in verse 9 and omits "abides": "he cannot sin" (i.e., he cannot sin when abiding in Him). Two other difficult passages are clarified at length in the book, namely, 1 John 3:15 and 1 John 5:16-18. Rokser shows convincingly that each passage deals with the believer's abiding fellowship with Christ and vice-versa, and the impossibility of sinning at the same time. This practical, helpful, and insightful book is highly recommended and is available in paperback and Kindle eBook from Amazon.com for $7.95.